When Star Wars: The Clone Wars ended prematurely back in 2014, fans wanted to learn where Ahsoka would go next. One fan, Elisa Ardell, let her imagination play out the rest of Ahsoka’s story and she took us along for the ride. Star Wars Destinies is an online comic that follows Ahsoka and two ex-clone troopers: Slick and Dogma. The story has four complete chapters, and if you think that’s short, think again. That’s over 185 pages of character exploration and gorgeous art! Chapter 4, entitled “A Month of Nights”, ended in a shocking and heart-pounding way, and now, we get to see the repercussions because Chapter 5 officially kicks off today, August 16, 2016. Before you head on over to the Star Wars Destinies Tumblr site to catch up with Elisa’s captivating story, find out what she had to say regarding this next chapter and what she might have in store for us in the future. How do you feel about this next chapter of the story? How do I feel about this chapter going into it? Good. Really good. Am I allowed to say that? Lol. Seriously, though, I’ve had elements of this chapter in my head since before I finished what would become my first week of posts for this comic as a whole. So this is something I’ve very much been looking forward to, for years now. And while there have been times I’ve struggled with my health and wondered if I’d ever get to this point, I’m really happy I’m here now, and I look forward to where the comic goes from here. Where do you want the story to go and how much longer do you have to complete it? That first part of this question is more difficult than I thought it would be to answer because I don’t want to give anything away really. But, I can say that I’m somewhere between half and three quarters of the way done. So, three fifths? Back to that first bit, though—where do I want it to go? The goal of this comic has never wavered from when I first started it. I wanted to tell a story of a set of people who find what they need from one another, and even if things may not go the way people could speculate, I still hope they see it as a happy ending. It has been incredible! I’ve had so many kind comments about the comic and the story I’m telling. I love that I”m creating something that people are enjoying so much. There were times I was worried about how people would respond to something, or if it would come off differently than what I had intended, but the response I’ve gotten has always made me positive about going forward. The fans are incredibly understanding and supportive and I love them for that. They’ve made the atmosphere for creating the comic even more fun than I was ever hoping for it to be. Like the Clones, they’re all more than just numbers to me. They’re people who make me even more excited about something I’m already really enjoying doing. And that’s something really special. 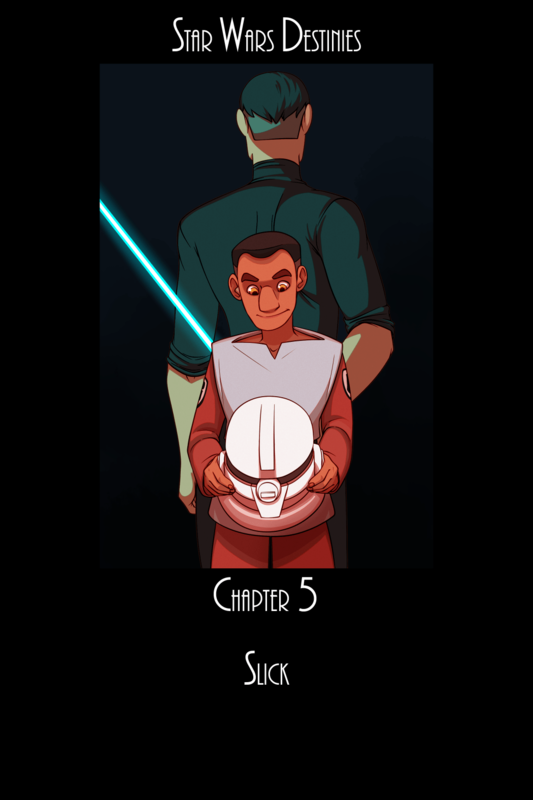 In addition to the first full page of the fifth chapter, make sure to check out the introduction as well as the cover (as seen above). Star Wars Destinies updates every Tuesday and Thursday at 12pm EST, so make sure to check it out and follow Elisa’s story!